Tommy Chong's next show on his LiveVideo channel will be August 6th at 8PM PST. If you have a camera, Tommy will be able to see you and you can ask him questions. You can even email Tommy your questions now. Tommy's bound to be talking about the Cheech & Chong: Light Up America comedy tour which was announced yesterday. CNN has posted video of their news story on the reunion of Cheech & Chong. Fox News was at the Cheech & Chong: Light Up America press conference earlier today. The following is video of their news coverage. During today's press conference, Cheech and Chong told reporters that the Cheech & Chong: Light Up America Tour will be theatrical. When they toured early in their careers, the duo's props were a bag of used clothes, but the new tour will have large video screens to flash images on. Live Nation will be producing the tour. Photos from today's press conference, including pix of Cheech and Chong with marijuana plants (plastic plants) will be posted here in a couple days. Successful beyond their wildest dreams, the iconic comedy duo Cheech & Chong defined an era with their hilariously irreverent, satirical, counter-culture, no-holds-barred comedy routines. Cheech Marin and Tommy Chong's phenomenal success began on the stand up comedy circuit which led to 9 hit comedy albums and 8 hit films, breaking box office records, shattering comedy album sales, garnering multiple Grammy nominations and mesmerizing fans for more than a decade. Today, from the world famous Troubadour where they were initially discovered, Cheech & Chong announced their first tour in over 25 years, an epic cross country U.S. trek with over 22 dates confirmed; additional dates to be announced in the coming weeks. Cheech & Chong: Light Up America ... tickets go on sale nationally at 4:20 PM on August 8th and are available at http://www.livenation.com/. The Live Nation produced tour will kick off on September 12th at the Tower Theatre in Philadelphia. Other highlights include Los Angeles, Washington DC, Detroit, Atlanta, Miami, Minneapolis, Houston, Dallas, Phoenix, Austin, Seattle, Boston, San Diego and Denver to name a few. Chong's wife and comedy partner, Shelby Chong, will open all dates on the tour. With nine albums released from 1972 through 1985, the duo was nominated for four Grammy Awards, winning the Grammy Award for Best Comedy Album with their third album, Los Cochinos, released in 1973. Big Bambu, their second album, was the biggest selling comedy record of all time in 1972 and remained so for many years. Their stunningly successful comedy streak transitioned to film in 1978 with their first movie, "Up In Smoke," the highest grossing comedy of 1978, topping $100 million at the box office. Cheech and Chong co-wrote and starred in a total of eight feature films together, all directed by Chong. The comedy duo was initially discovered at the Troubadour in Los Angeles. We've dropped the price of Cheech Marin's Born in East LA DVD. Lionsgate has postponed the August 8th release date for their film The Perfect Game. Lionsgate hasn't decided on a new release date yet, but it may be this October in time for the World Series. The film is directed by William Dear from a screenplay by W. William Winokur, and is produced by David Salzberg, Christian Tureaud, Mark Koch, Daniel de Liege, Winokur and Michael Gallant. The film stars Clifton Collins, Jr. (CAPOTE, "Thief"), Cheech Marin (CARS, BORN IN EAST L.A.) and Academy Award(R) winner Louis Gossett Jr. (DADDY'S LITTLE GIRLS, AN OFFICER AND A GENTLEMAN). The film's original score is by Academy Award(R) winner Bill Conti (ROCKY, THE RIGHT STUFF). VH1 is currently working on a documentary about Cheech and Chong titled, Lords of the Revolution: "Cheech and Chong". We first reported this back in May. As part of their Make 'Em Laugh series, PBS is working on a special about Cheech and Chong. PBS' MAKE 'EM LAUGH: THE FUNNY BUSINESS OF AMERICA, is a new historical documentary series chronicling more than a century of American comedy, produced by Thirteen/WNET New York and Ghost Light Films. In the tradition of BROADWAY: THE AMERICAN MUSICAL – winner of the 2005 Primetime Emmy Award for Outstanding Nonfiction Series – MAKE 'EM LAUGH melds comedy performances with biographical portraits and 20th-century history in probing what has kept America rolling in the aisles – and why. In Spring 2009, HarperCollins/Rayo will be releasing Cheech and the Spooky Ghost Bus (Spanish Edition) by Cheech Marin, illus. by Orlando Ramírez, in which Cheech is afraid of a haunted bus. This book is the third book in the series. Last year, Cheech released Cheech the School Bus Driver and earlier this month, Cheech released Captain Cheech. They are available for sale on Amazon.com and at bookstores nationwide. To celebrate the WORLD PREMIERE of Touchstone Pictures’ SWING VOTE, a comical look at the journey of one father and daughter who discover that everyone has the power to change the world. SWING VOTE follows the story of Bud Johnson (KEVIN COSTNER), an apathetic, beer-slinging, lovable loser, who is coasting through a life that has passed him by. The one bright spot is his precocious, over-achieving 12-year-old daughter Molly. She takes care of both of them, until one mischievous moment on Election Day, when she accidentally sets off a chain of events which culminates in the election coming down to one vote…her dad’s. Directed by Joshua Michael Stern, produced by Costner and Jim Wilson and written by Jason Richman and Stern, SWING VOTE also stars PAULA PATTON, KELSEY GRAMMER, DENNIS HOPPER, NATHAN LANE, STANLEY TUCCI, GEORGE LOPEZ, WILLIE NELSON, JUDGE REINHOLD, MARE WINNINGHAM, RICHARD PETTY, and introduces MADELINE CARROLL. Opens in theaters August 1, 2008. Danish actor, Carol Van Herwijnen (1941-2008), passed away in Amsterdam on July 7, 2008. Van Herwijnen was the hotel clerk in Cheech and Chong's Still Smokin. He was in many films and was also the voice of one of the Smurfs in the original Smurfs cartoons. In 1988, he won the Louis d'Or (the Dutch equivalent for the Tony Award for best actor). Actor/comedian/art aficionado Cheech Marin turns 62 today. Cheech was born July 13th, 1946 in Los Angeles, CA. Cheech Marin spoke to beliefnet about his new film, A Perfect Game. We don't know a whole lot about this video. It was recorded recently. Tommy provides words of wisdom. Tommy Chong posted video of him at the 30th Anniversary screening of Up In Smoke. The anniversary took place in April (04/20) in Sherman Oaks, California. This is from Tommy's LiveVideo channel. Not only was Cheech Marin promoting his Lifetime movie, The Miracle of Dommatina., at the television Critics Association yesterday, but he was also promoting the Hallmark movie, Expecting a Miracle. When asked about Cheech and Chong, Cheech said, "I've made peace with it." "Maybe I've tried to distance myself, by creating a separate image of myself in the intervening years. But I've never, ever put down Cheech & Chong. I loved being Cheech of Cheech & Chong; are you kidding? Who wouldn't? It was the happiest of times. As a matter of fact, Tommy and I are getting together and doing something quick, because time's awasting here. Cheech & Chong is all over the world. It spoke to a whole generation. And something that is that iconic, you want to pay tribute to it. It's a big part of me, and that was some of the best things I ever did." Cheech also said that he taught Ed Asner how to roll a joint, but Ed wasn't one of his best students. Update: IGN had a chance to interview Cheech. 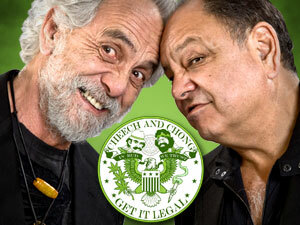 Cheech said that he and Chong have recently, "been writing and seeing what we can remember." When asked if he'll be in Robert Rodriguez' proposed film, Machete (based on the fake Grindhouse trailer), he said "I would love for him to do that! I'm just waiting for him to call me. Call me Robert! Let's do it, man!" IGN ran into Cheech Marin today at the Television Critics Association press tour. Cheech was promoting his new Lifetime movie, The Miracle of Dommatina. Cheech said that he got the gig on Lost because he had previously worked with Lost executive producer, Carlton Cuse, on Nash Bridges. He couldn't refuse working in Hawaii. Cheech says he will probably also be appearing in the next season of Lost. 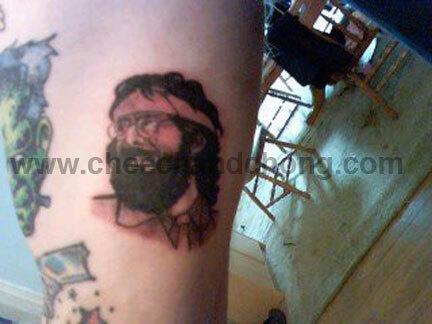 Cheech and Chong fan, Dave, emailed us a photo of his Tommy Chong tattoo. It was done by Donny Price at Cellar Dweller Tattoos in Rockford, IL. Someone posted this video of Cheech Marin and Tommy Chong in a Thor video for the song Knock Em Down. There is an interview in the middle of the video from the USA Network show Radio 1990. During his LiveVideo chat last night, Tommy said that he and Cheech filmed three Obama commercials which will be on youtube soon. Musician, Heather Haze, got to appear in the commercials. "Well, here’s my story. There I was, playing my sax on Hollywood Boulevard, when suddenly a woman wearing an audio set rushes over to me and hands me a twenty, saying, “Hey, would you mind not playing for about twenty minutes? We’re filming over here.” I looked at her a second, laughing inside, and said, “Sure!” So I pocketed the twenty, picked up my stuff and wandered over to see what the hubbub was about. There was Cheech and Chong, playing the blues, next to cardboard cut-out of Obama. I just watched for a bit, amused, when suddenly the guy next to me gets excited, “Hey, it sounded like you were in the same key…why don’t you jump in the shot and play?” I chuckled and said, “Nah, I couldn’t do that.” Then he said, “No no, it’s okay, I’m with the crew. Get in there!” So next thing I know, there I am, jamming with Cheech, Chong, and Obama. Heh. You never know what’s gonna happen in Hollywood, baby. ;)"
Tommy and Shelby Chong created a funny sketch called the 421 Club. It's a spoof on the 700 Club. He posted it on his LiveVideo channel. Tommy and Shelby Chong were broadcasting on their LiveVideo channel this evening. It began at 9PM PST and lasted for one hour. This was their second live broadcast. The first took place in the beginning of June. They answered lots of questions from fans. Tommy revealed that he and Cheech recorded three really funny Obama commercials which will be on youtube soon. It involves a cardboard cutout of Obama and graffiti. He also revealed that he and Cheech will be doing 30+ comedy dates beginning in September. The preparation and stand-up gigs will be filmed for a feature release from the Weinstein Company. There will be additional films after this stand-up film.